Sir Thrift A lot: Thriftosaurus & Large Haul! Love the Kimberly mugs! And the canisters! Amazing haul this week! You got a really good deal on the Lustro Ware canister set. 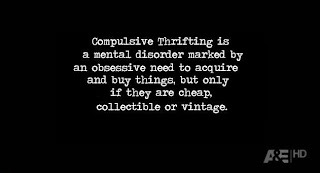 I paid $40.00 for mine at an estate sale. Be really careful when you wash them though. I cracked one of mine when I was drying it. Evidently the plastic gets pretty fragile with age. You will totally be able to get that Pyrex striped bowl perfectly clean. I buy Pyrex with black marks all the time and always get them clean. Let me know if you need any tips. I will be linking up with you tomorrow. Thanks for the tip about the Lustro Ware, I probably would have ended up cracking mine to bits. My boyfriend challenged me on the bowl. Will probably take it on on Friday. Will holler if I can't made it nice & shiny. 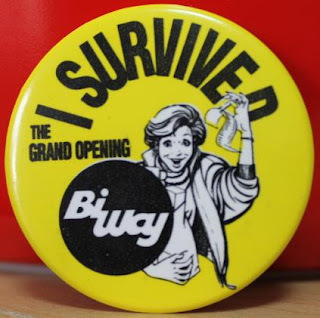 my favorite is the bi-way pin! hello nostalgia! i also really love those little birds. so charming. and the authentic vintage empire strikes back is pretty freaking sweet. another great haul! Oh I LOVE the birds what a find! really great haul! i haven't been out at ALL in almost two weeks! i'm getting the itch! Well get out there! I love checking out all your finds. I love the birdies! Great haul. Tons of fun stuff this week! I know what you mean about the canisters... I'm always so tempted, but usually they're just not worth it. What a haul! I have the biggest "flower" yellow canister in that set, and I hope the Pyrex cleans up. 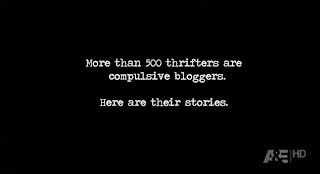 I laughed for quite a while when Iread the AE "Bloggers SVU" pictures at the end of the post, haha So true! Glad I could make someone laugh! Thanks, I hope the Pyrex cleans up too. If it does, it's going to open a while new "damaged" Pyrex world for me. "Uh Uh oh oh oh...the right stuff!" Sorry, I had to go there! I LOVE those NKOTB cups! Jordan was my favorite! DO NOT be on the fence about your new canisters! I would love to find a set of these anywhere that didn't charge an arm and a leg! I think they are awesome! Wow, you bought loads! I only got a few things this week but two of them were on my 'to buy' list for literally years! Hope I can cross off a few more things off my 'to buy' list. Bummer for the store owners, score for you! Really loving the mugs. I never see those is good shape. First time I've ever, too. Great score and price for the Vintage Stars Wars glass! My husband still has his along with a Miss. Piggy one! I nearly died when I saw the BI Way pin ~ that was my favourite store growing up. I couldn't wait for the weekly flyer to be delivered! haha - I was going to put the bag of buttons back, but I just couldn't let this Bi-Way pin go, it's too fun & wanted it in my collection. I love it ALL! That's quite the amazing score. That little exercise book might be my fav, so simple with gorgeous typography. Thanks Van! The exercise book is one of my favourite scores this week. Anybody else is interested in receiving a FREE MC DONALD'S GIFTCARD?